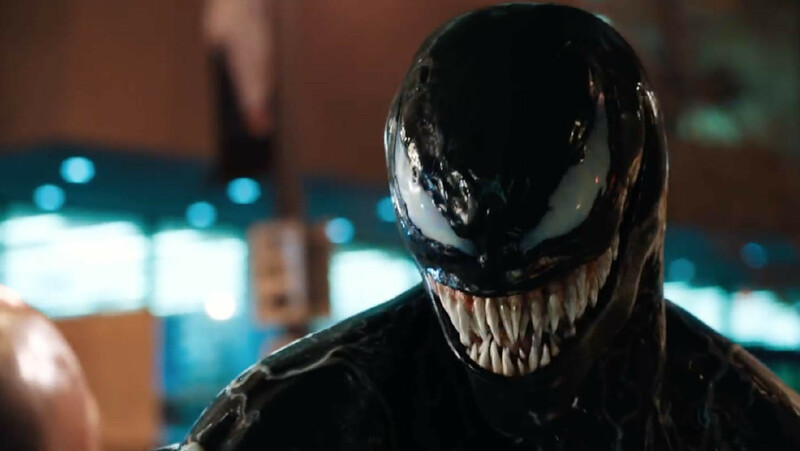 SYNOPSIS: One of Marvel’s greatest and most complex characters takes center stage as Eddie Brock (Tom Hardy) becomes the host for the alien symbiote Venom. As a journalist, Eddie has been trying to take down the notorious founder of the Life Foundation, genius Carlton Drake (Riz Ahmed) – and that obsession ruined his career and his relationship with his girlfriend, Anne Weying (Michelle Williams). Upon investigating one of Drake’s experiments, the alien Venom merges with Eddie’s body, and he suddenly has incredible new superpowers, as well as the chance to do just about whatever he wants. Twisted, dark, unpredictable, and fueled by rage, Venom leaves Eddie wrestling to control dangerous abilities that he also finds empowering and intoxicating. As Eddie and Venom need each other to get what they’re looking for, they become more and more intertwined — where does Eddie end and Venom begin? Venom reminds me a lot of Michael Bay’s Transformers. An alien race of super creatures comes to earth, one bonds with a good guy and one bonds with a bad guy, then a bunch of special effects, action sequences and a romantic subplot ensue until the predictable ending. For its credit, Venom is not an unentertaining movie. I enjoyed many of the individual parts that made up the film. There were a lot of moments that had me and the rest of the audience laughing, and much of that was because of Tom Hardy’s performance as Eddie Brock. Hardy’s acting made the movie for me. His character was the likeable loser and Hardy sold it. With his wise cracking demeanor balanced by an endearing heart for people, Eddie Brock is someone you want to root for. If only he didn’t suffer from something many of the characters in the movie were written with: stupidity. Honestly, everyone in this movie is an idiot. The main antagonist, Carlton Drake (Riz Ahmed) is an idiot who is inconsistently written as either a futurist who wants to see humanity reach the stars or a misanthrope who prefers aliens to people. Eddie Brock’s girlfriend Anne Weying (Michelle Williams) is dumb for being too trusting of an alien symbiote and not trusting enough of her fiancé of many years. And Eddie… is also an idiot for just making a lot of bad decisions with his career. The poor writing of these characters is indicative of a larger problem for Venom, and that is that of its plot. I felt that a lot of scenes were contrived just for the sake of the plot happening. Characters partook in actions not because they were the most logical things to do, but just because that’s what would drive the plot further. This kind of lazy writing led to so many plot holes, I struggled to keep up with what was going on from one minute to the next. At one point the climactic villain of the film, a symbiote named Riot that only really shows up for the last few minutes, tells Carlton Drake “we need to find Venom.” You would think then that Venom is integral to Riot’s nefarious plans. Nope. Riot then immediately forgets about retrieving Venom and goes on about his business. At another point, Venom tells Eddie Brock that his world is going to end. Quite ominous and sinister no? Well then Venom has a change of heart and wants to save the Earth. Why? “Because of you, Eddie,” said the symbiote… Huh? That’s not really explained any further and it left me wondering how the parasitic alien had such a quick and dynamic character arc after doing nothing but fighting goons. Speaking of fighting goons, the action scenes were really good! When you finally see Venom in action, it’s a sight to behold. The special effects for the combat holds up well in most sequences, and I think the fight choreography was very solid, especially in the first fight in Eddie’s apartment. The film does a good job of making Venom seem monstrous, which is an element that was missing in his appearance in the third Tobey Maguire Spider-Man movie. The way Venom lopes on all fours is menacing, and his proclivity for eating faces is perfectly grotesque for the character. The problem is, there just wasn’t enough Venom in Venom. The titular character doesn’t show up until well into the film, and after his true beastly form is revealed, he still prefers to hang around in Eddie Brock’s head most of the time. This is sometimes alright because the dialogue (monologue?) between Eddie and Venom in his thoughts is funny for the most part, but I felt that the directors couldn’t decide on a tone whether they wanted the symbiote to be comedic or creepy. For reference, one moment Venom is describing how he will eat a man, the next he’s calling Eddie a “p***y.” This just felt off to me. There’s a lot of things I can say about this movie having inconsistent plot and logic, with characters changing motivation and explanations for symbiotes being tossed out the window within minutes, but I won’t go into spoiler territory. This movie is fun enough if you turn off your brain and just want to see Venom kick some tail, but even then there’s not enough of that in the movie to justify the entire thing. I’m a big fan of the character of Venom, and I was left disappointed.